The Herschel-Heterodyne Instrument for the Far-Infrared (HIFI) -- PDF (0.8MB), de Graauw et al., 2010, A&A, 518, L6, in-flight scientific capabilities of the HIFI instrument. A significant number of the data taken by HIFI in the framework of the Performance Validation (PV) and routine phase are now publicly available. There are particular caveats that apply to those data. They are described in this disclaimer note. HIPE and Java 8 : please consult the HIPE Known Issues page regarding important information on issues with Java for different versions of HIPE. Should I reprocess my date with HIPE 15.0 ? HIPE 15.0 is the final user release of HIPE. This version provides an optimisation of various interactive analysis tools offered within HIPE, however, it does not provide any change in the instrument pipeline algorithm. As such products generated with HIPE 15.0 will be identical (within negligible differences for very particular cases - see the DP known issues page) to those generated during the last bulk reprocessing, which corresponds essentially to HIPE 14.1 for HIFI products. The main new or upgraded functionalities offered by HIPE 15 are summarised in the What's New page. Which data did most benefit from being reprocessed in HIPE 14.1/14.2 ? HIPE 14 introduces a new product providing an estimated breakdown of the intensity calibration uncertainty. The uncertainties are given separately for each component, as well as in a quadratic sum fashion for all statistically independent elements. This sum applies to the calibration of data in the Ta* scale. Further systematic and random error apply for data converted into different intensity scales (e.g. Tmb or Jy). See further details in section 9 of the DRG. In HIPE 14, those observations where the interlacing mode was activated (i.e. using more than just 9 guide stars in the star tracker) will benefit from an more accurate reconstructed astrometry and so positions may change in those cases. On top of that, the quality figure associated to the new gyro-propagated method introduced back in HIPE 13 (see also the following Pointing Information page) is now computed in a slightly different fashion. Since the application or not of the gyro-propagated pointing is, for HIFI, conditional upon a certain threshold on this quality (avoiding to apply the new pointing reconstruction to under-performing case), the number of case making us of one or the other approach will differ in HIPE 14 - we recall that in case the gyro-propagated method is discarded, the pointing is the same as that used back in HIPE 12.For the HIFI data such a correction is applied in a conditional fashion depending on a quality figure computed for each individual observation. The new pointing reconstruction will not apply to under-performing cases, and those latter will still use the pointing files used back in HIPE 12. Details about the new attitude reconstruction, and the way it is approached and may impact the HIFI data, can be found in this memo. From HIPE 13 onward observations in bands 6 and 7 have been automatically corrected from the Electrical Standing Wave affecting those data. The correction is based on an optimised fit to the baseline artefact stored in the HIFI calibration files and applied by the pipeline. In HIPE 14, some of those stored solutions have been refined and so the resulting products will be improved. For instructions on how to benefit from this reprocessing and see the typical improvement expected in the data please refer to this section from the HIFI Data Reduction Guide (DRG). The reprocessing of spectral scans in HIPE 13 made use of optimised mask tables for spurs and unruly baseline ranges, resulting in improved deconvolved solutions at the Level 2.5 (an example of such improvement between HIPE 12 (left - red) and HIPE 13 (right - black) is shown in this plot - see also section 5.4 of the DRG). In HIPE 14, a dozen of additional spectral scans (mostly from the calibration programme) have been added to this list.In order to benefit from this update you should reprocess your data from Level 0 with the new calibration tree. In HIPE 14, a new channel flag has been introduced ("warning") that will be assigned to the data based on a knowledge base of spurious features built from the spectral scan flagging (see bullet above). These flags will be applied to all point and mapping observations. They should be taken as indicative as they not necessarily accurately match spurious features in the data where they got applied. For this reason, this new flag is not honoured by any of the standard interactive post-processing tasks. In HIPE 13 the data used in the OFF positions were already processed up to an equivalent Level 2 calibration (both in intensity and frequency) in order to be directly comparable to the ON-target data. In HIPE 14, those OFF spectra will also hold spur and warning flags that will be propagated from the ON-targert ones. This feature is for example very interesting in order to perform a deconvolution of the OFF spectras in a spectral scan and be able to compare the OFF spectra to the level 2.5 deconvolved products of those observations. A bug (see here) was fixed in the calculation of SSO ephemeris positions (ra_centre/dec_centre) that led to offsets of up to ~10". This bug affected users that use cubes in a co-moving frame (including the standard Level 2.5 cubes), use the doOffset task, or make explicit use of ra_centre / dec_centre in their HIPE scripts. The offset is practically constant over a map and could, e.g., make the emission of a comet appear to be off-center when it really isn't. The fixed bug is in the Level 0 pipeline, which users cannot run easily. The issue was fixed in HIPE 11.1. A new pipeline step, mkDbsReference, calculates the differences in the chop positions in all DBS observations, and after applying the band-pass correction, stores them in a product in calibration->pipeline-out called ReferenceSpectra. This allows you to check for contamination in chop positions for all types of DBS observations. The pointing information attached to the data for observations taken between OD 320 and OD761 did not use the most accurate representation of the star tracker focal length. This was done for the bulk reprocessing with HIPE 9. As a consequence, some observations will experience a shift in astrometry, that can be as high as 8 arcsec. Details about the consequences for a particular obsid, and recipes to reconstruct the improved pointing yourself can be found at http://herschel.esac.esa.int/twiki/bin/view/Public/HowToUseImprovedPointingProducts as well as in the Level 0 section of the HIFI Data Reduction Guide. From 9.1 onwards, most of the observational parameters that got optimised in HSpot will be propagated into the observation context, under a new product called HifiUplinkProduct (in the auxiliary product branch). Some of these parameters will be used in the pipeline to e.g. estimate the dimension of the cubes in the mapping and have them more representative of how the map was really obtained. Cubes for moving targets are now created in the comoving frames in HIPE 9. In order to benefit from that, you should re-pipeline from Level 0 up to Level 2.5. Note that the hifiPipeline task should be called with the option "Aux=True". Please check the Pipeline chapter of the HIFI Data Reduction Guide for more details about how to do that. Other details about the benefits of reprocessing with HIPE 14.0 are also compiled in the HIFI Data Reduction Guide . If you are working in HIPE, the HIFI Data Reduction Guide will be your prime resource for all things HIFI but you should also look at the Herschel Data Analysis Guide for information about general tools, such as those for viewing and manipulating spectra and spectral cubes, and for obtaining data from the archive. You can create pdfs of each document by clicking on the pdf symbol at the top of the main page. Download data from the HSA. If you are downloading several observations it is better to use the tar ball. Assess whether data should be re-pipelined. Look at the section above and also at the What's New in the latest User Release to decide if you should re-pipeline. Note that the ICC recommends that data processing should not be allowed to fall more than one version behind the HIPE version being used. Fold frequency switch data. Frequency switch data is not folded in the pipeline and can be done with the doFold task. Average together H and V polarisation. The noise estimates given by HSpot assume that the H and V polarisations are averaged together. This can be done in HIPE with the PolarPair task, which resamples the spectra to the same frequency scale (they are frequency calibrated with different comb measurements) and then averages them. Alternatively, you can use the Accumulate task, which allows you to specify the resampling width if you desire. Note that differences may be seen in H and V profiles, see the note on H and V positions. If you are particularly interested in the spatial structure of your source you may prefer not to average the H and V polarisations together. Fit lines. The SpectrumFitterGUI, which is also a part of the Spectral Toolbox, can be used to fit line profiles. Save modified data You can save data to a pool, or store your session in order to continue working in HIPE. You may wish to export data as FITS, ASCII or read the data in GILDAS/CLASS. Products readable in GILDAS/CLASS: for products processed with HIPE 12 or later, you can directly read the HCSS-generated FITS files into CLASS (more details about the FITS reader can be found in this report). For products processed with an earlier version, you should use the HiClass task to export data as CLASS readable FITS files. Notes: (1) If you import products processed in HIPE 12 or 13 some warnings will be raised about missing meta-data, but the import will proceed. (2) The FITS file from Level 2 and 2.5 observations downloaded from the HSA are gzipped files. It is recommended to test that the FITS are properly un-zipped before reading to CLASS (for example using the utility ‘fv’ (FITS Viewer) among others). (3) HSC cannot guarantee that future CLASS version will be able read the HCSS-generated FITS files. linelist.txt (the CASSIS lineList) Note that a copy of the linelist is now part of the HIPE build. The data needs to be deconvolved to a single sideband solution. This can be done with the doDeconvolution task, which works with an ObservationContext. It is important to clean the data before deconvolving it: this means removing standing waves, correcting baselines, and flagging out any spurs or bad data that the pipeline missed. The calibration tree for HIPE 14 provides optimised mask tables for each spectral scan obsids so it is recommended that your make use of those, typically be reprocessing your data with HIPE 14 and this calibration file (see above). If you are planning to deconvolve your data with CLASS, please contact the Helpdesk, and cc to Claudia Comito (email:ccomito@ph1.uni-koeln.de) if you need further details. Spectral cubes from all HIFI mapping observations are produced as part of the SPG pipeline (that is, the pipeline run for the HSA) and are now found in the Level 2.5 product. However, baseline and standing wave corrections are not done automatically in the pipeline because of the risk of harming the scientific content of the data. This can now be customised in the Level 2.5 step and be done prior to the cube creation. It is strongly recommended that you inspect your Level 2 HTPs for baseline drift and residual standing waves, and decide if some, or all, datasets need to be cleaned up before re-running the gridding task. Regridding in HIPE > 9 will automatically use the comoving frame for SSOs. Considering the section above, mapping observations of SSOs will benefit from reprocessing in HIPE > 11.1. You can then grid your cleaned data into a spectral cube using the doGridding task, you can also use this task to customise the cube creation to best suit your science goals. Sideband ratio technical note: This note describes the general calibration problem associated with the sideband gain imbalance existing in double-sideband heterodyne systems such as HIFI, and provides some recipes and calibration tables applicable to the particular case of the HIFI mixers. 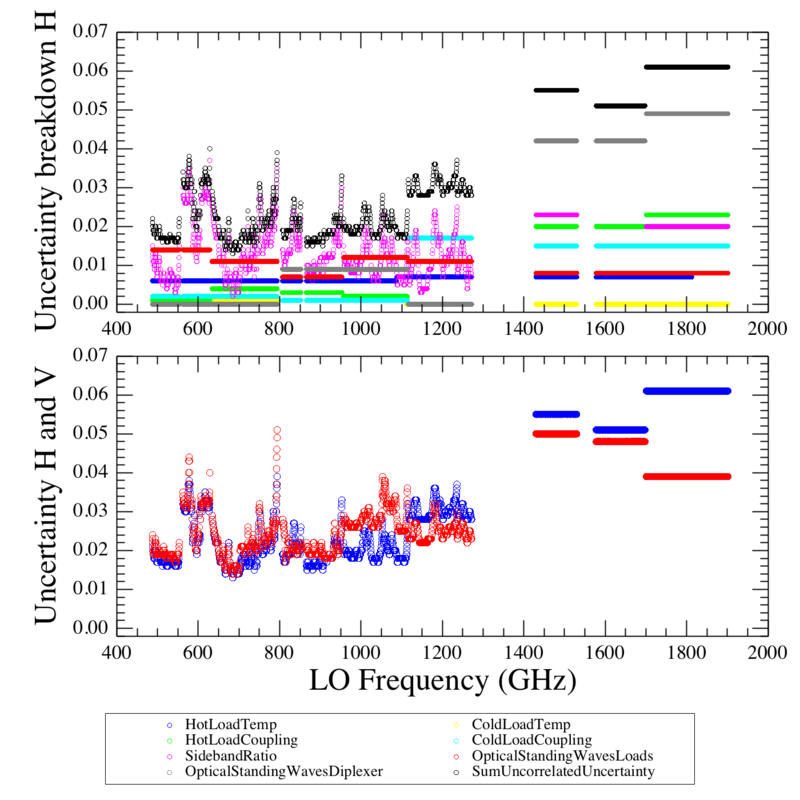 http://arxiv.org/abs/1404.2806 : "The effect of sideband ratio on line intensity for Herschel/HIFI", Experimental Astronomy. After an extensive investigation, the HIFI ICC has introduced updated sideband gain ratio in the calibration tree. A final documentation is still in preparation but the overview of the sideband gain ratio frequency dependence in each band is illustrated in this plot. HIFI frequency/velocity transform document: a document describing the frequency and velocity handling algorithms adopted in the HIFI pipeline. This repository of system temperature plots across the IF for each HIFI subband (updated 24 Jan 2011) inform about the variation in system temperature (sensitivity) across the HIFI intermediate frequency band at various frequencies. The following table provides the percentage flux error associated with each component of the error budget. These numbers are updates from the Roelfsema et al. 2012 paper and reflect what was implemented in the calibration files of HIPE 14. The detailed frequency dependence of this uncertainty budget is shown in this plot. *Note that the "sideband gain ratio" convention used in the HIFI pipeline does not correspond to the ratio between the respective sideband gains (equal to 1 for a balanced system), but to the gain in one sideband normalised by the combined gain of the two sidebands. Consequently, perfectly-balanced sidebands will feature a sideband ratio of 0.5 (see also Kester et al. 2016, and the Intensity Calibration Framework document). **For a point source (worst case scenario) - this flux loss estimates takes into account an APE of 1.2", a residual SIAM bias of order 1.5" and the fact that the H/V respective apertures are slightly offset from the middle synthetic aperture used to point the telescope (offset ranging between 3" in band 1 and 0.5" in band 7). See also section 5.6 of the HIFI handbook . A revision of the HIFI beam analysis has been performed, based on a multi-epoch set of measurements on Mars. As a result, a more accurate description of the HIFI beams has been obtained, leading to some change in the beam coupling efficiencies, typically a drop. The details of the analysis and the revised coupling efficiencies are given in this release note. For the record, the first release of the HIFI beam efficiencies was described in this document (17 Nov 2010). Please note that these updates will only be featured in the HIFI calibration tree from HIPE 13 onwards. In addition to this, a detailed description of the HIFI beam models is provided as 2-D beam maps, 1-D azimuthal beam averages, and Encircled Energy Fractions (EEF). Each are provided at two frequencies per mixer band and polarisation, and can be extrapolated (within the LO frequencies of a given band) as a function of wavelength. The release notes provides further details about the delivered files and how to use them. In particular, some useful functions are provided in this Jython script. The beam material is concatenated as a single FITS file per mixer, frequency, and polarisation. Each file has three extensions tables: one for the 2-D beam model maps (2705x2705 pixels), one for the EEF, and one for the 1-D azimuthal beam averages. Note that 2-D beam model of smaller size (201x201 pixels) will also be made available in the calibration tree (not before HIPE 13), and used in the generation of Level 2.5 cubes by the pipeline. The following page provides links to each individual file (27 Mb each). 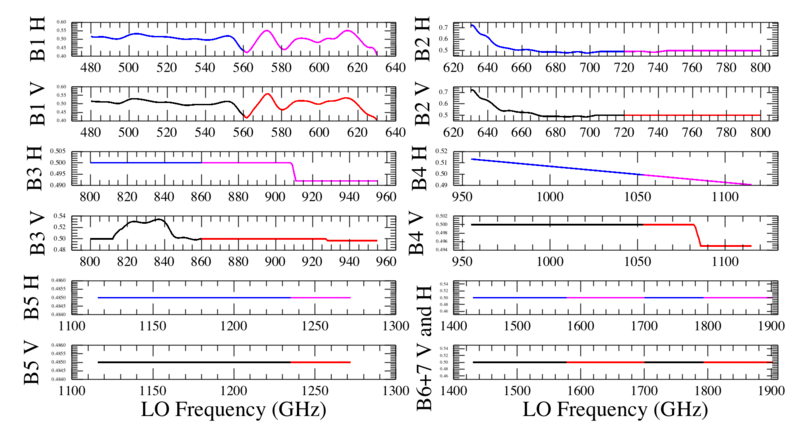 Plots of the 1-D azimuthal beam averages, and EEF for each band can be found in the Appendix B of the release note. Information about what calibration is found in the HIFI ObservationContext is found in the Data Primer of the HIFI Data Reduction Guide. Information about how to find what calibration version was used on your data, how to get the latest calibration, and reprocess observations with it is found in the Pipeline chapter of the HIFI Data reduction Guide. The latest calibration tree pool can also be retrieved directly here (26 September 2016). 24_0 10-12-15 14.0 Major update of all sideband ratio tables. Introduction of uncertainty budget tables. Introduction of spur warning tables for all point and mapping observations. Update of some Electrical Standing Wave correction solutions. Added some spur flag tables for a handful of spectral scans, as well as some remaining corrupted data-frame entries for flagging at level 0. Updated smoothing width for load chop processing in band 6a, allowing to mitigate the affect of strong artefacts present at tunings between 1457 and 1459 GHz. 25_0 01-04-15 14.1 Minor update to table of BBIDs in order to allow processing of a handful of calibration observations. Remove sine waves, or combinations of sine waves. Check the bullet about usage of the fitHifiFringe task in the data reduction section above. A new task hebCorrection has been implemented in HIPE 12.0 and is being used by default by the pipeline in HIPE 13 (see also the Reducing HIFI data section above). We warn that the task does not guarantee an accurate correction in all circumstances . The task is described in the following document. The mathematical background can be found in this proceeding. Unlike the script made available in previous version of HIPE, this task is applicable to any HIFI observing mode. in case of strong source continuum some standing waves can be enhanced, as described in the Alternative Calibration Scheme report. Such standing waves can be significantly reduced in amplitude using an alternative pipeline algorithm known as the Modified Passband Technique , which is described in the Standing Wave Removal chapter of the HIFI Data Reduction Guide. Alternatively, you can run the Level1PipelineAlgo_hc_filtered_v1.py script. Baseline removal: imperfect ON-OFF calibration scheme can result in residual baseline distortion (not necessarily standing waves). Check the bullet about usage of the fitBaseline task in the data reduction section above. Spectral purity: in a small number of cases, there are places over the HIFI frequency range where the Local Oscillator does not offer a single frequency tone, so that spurious spectral line may end up in the data, and the calibration of the targeted line gets affected. Details are given in Section 5.3.2 of the HIFI handbook . Spurs: Spectral Spurs are narrow and broad spectral features due to instabilities in the Local Oscillator. Up to HIPE 12, spurs have been assigned by the pipeline in an automatic fashion. In HIPE 13, this is no longer the case and the masks are assigned based on a priori tables provided by the ICC in the calibration tree. As of now, all spectral scans benefit from such tables, but only a handful of single point and spectral mapping observations. This limitation has little impact on the top level data though since no pipeline module makes use of these masks in those modes. A list of the spurs registered in all spectral scans has been incorporated into the HIFI calibration tree, and is used to automatically flag data accordingly in the pipeline. The following interest groups relate to processing of observations taken with HIFI. The links provided allow subscription to these interest groups. User scripts: Users are welcome to submit scripts they believe could be of general interest to the community to the Herschel Helpdesk.